GPS users... 39º 54' 32.89" N, 105º 04' 39.78" W will lead you to our front door! - Take the 104th/Church Ranch Blvd. exit. - Go east on 104th Street one block to first light (Westminster Blvd). - Turn left (north) on Westminster Blvd. ...the street name will change to North Main St. (formerly Pierce St.). - Continue north on No. Main St. to 116th Ave.
- Turn left (west) on 116th Ave. to Teller Street. - Turn right (north) and go one block on Teller to 116th Place. - Turn left (west) on 116th Place to shop. - Take the US 287 exit. - Go north on 287 (Wadsworth Blvd.) past first stoplight/intersection. - Turn left onto exit ramp to 120th Avenue. - Go east on 120th to No. Main St. (formerly Pierce St.). - Turn right (south) on No. Main St. to 116th Ave.
- Turn right (west) on 116th Ave. to Teller Street. 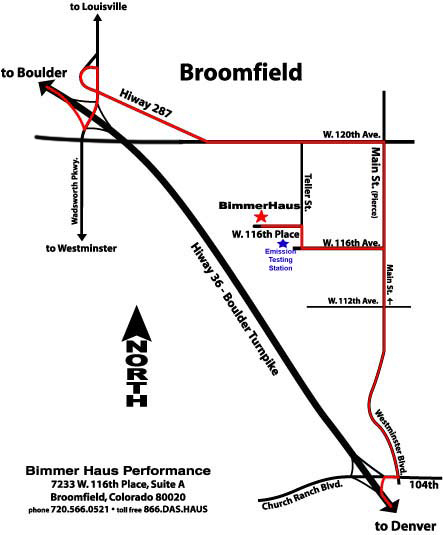 When heading to or from Bimmer Haus, please be respectful of speed limits in the area. The limit on 120th in the construction zone is 30 mph and is patrolled regularly. The limit on 116th and Teller Street is only 25!